In a case that was recently decided by the United States Supreme Court, the issue was whether the police could go onto a suspect’s property and search a vehicle that was in the driveway under a partially enclosed portion of the house, likely something built to provide shade for the vehicle. In this case, the police were searching for a stolen motorcycle. They believed the motorcycle was located at the house in question. When they arrived, they saw what appeared to be a motorcycle under a tarp in the driveway. The police officer walked onto the property, looked under the tarp and ran the tag of the motorcycle. After determining the motorcycle was stolen, the owner of the house was arrested. The criminal defense attorney filed a motion to suppress the evidence of the stolen motorcycle because the police officer did not have a legal basis to search it on the defendant’s driveway. There are a couple of legal principles involved here. There is something called the motor vehicle exception in search and seizure law. Normally, if the police want to search the property of a person, the police have to get consent or a search warrant. However, automobiles are different for two reasons. One, there is less of a reasonable expectation of privacy in an automobile because they are driven around and parked in public, and people can generally see inside of them through the windows. Two, automobiles are easier to move from one place to another making it easier to dispose of evidence inside. 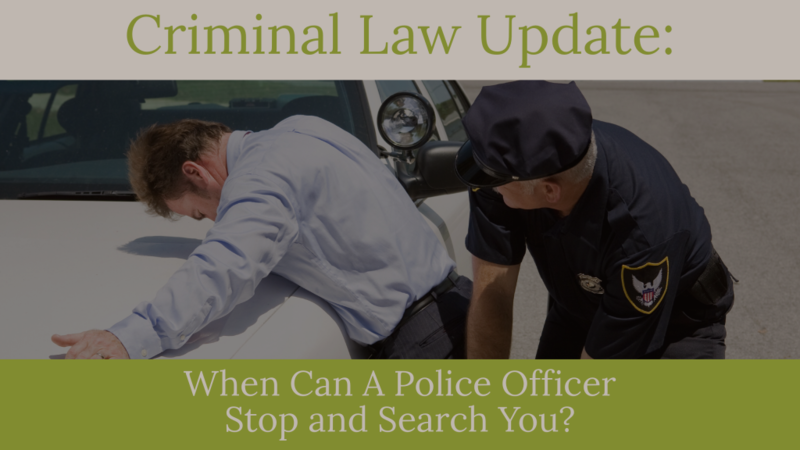 As a result, the automobile exception allows a police officer to search an automobile without a search warrant if the police officer has probable cause to believe there is evidence of a crime in the vehicle. A competing issue in this case is the idea that people have a strong expectation of privacy in their homes and the immediate area surrounding their homes, i.e. the curtilage. The curtilage is generally defined as the immediate area surrounding the home along with a porch and any enclosed areas near the home. This would also seem to apply to property that is enclosed by a fence that is clearly not open to the general public. The police may not go into these areas to search without consent or a search warrant. In Florida, one exception to a search warrant requirement is consent to search from the owner of the property or someone in possession of the property who appears to have authority to give consent. Police can generally walk up to any person, vehicle or residence and ask to search without a warrant and without probable cause. If that property owner agrees, the police are free to search. However, there are limitations, and people should always understand they have a constitutional right to refuse any police request to search one’s property. In this case, police officers drove to the defendant’s property in a rural area south of Jacksonville, Florida. They went through an open fence and ignored the “No trespassing” signs. They knocked on the front door, but no one answered. The officers then got back into their vehicle and kept driving on the property to a barn where they found marijuana. They ultimately arrested the property owner for various marijuana charges. The criminal defense attorney filed a motion to suppress all of the marijuana evidence because the police did not have a right to come onto their property and search it. At the hearing, the police officers testified they previously had permission to enter the property. It was determined during the hearing that the permission was given three years earlier by the previous property owner. People ship drugs to other parts of the country. They do it using the US Postal Service and Federal Express and UPS and any other delivery service. They do it by shipping to a location where nobody lives expecting someone on the other end to pick it up as soon as the package arrives. Other times, they ship it to a known address but address the package to a fake name so the person who receives it can claim ignorance if the police find out. And there are other methods people use to send illegal drugs to other people. The police catch many of these packages. Many of these packages have similar appearances and methods of shipment. Law enforcement also use drug dogs at the shipping facilities to smell packages (particularly those from states where marijuana is now legal). When they find a package that contains illegal drugs, they will attempt a controlled delivery which often consists of a police officer pretending to be a deliveryman and delivering the package to the listed address. Once a person at the address accepts the package, police will come in and make arrests. In a recent case near Jacksonville, Florida, the police discovered a suspicious package at UPS and decided to investigate. They learned that it was addressed to a fake person. They got a search warrant to open the package and found marijuana inside. One of the police officers disguised himself as a UPS driver and attempted to deliver the package, but no one answered the door. Later, the police knocked on the door to try and interview the resident. As they did so, an individual drove up to the residence. The police detained that individual and asked him questions to see if he was involved with the marijuana package. The police brought a drug dog to the scene and had the dog walk around the person’s vehicle. After alerting to that vehicle, the police searched it and found marijuana and other drugs inside. The criminal defense lawyer filed a motion to suppress the evidence of the drugs found in the vehicle because the police did not have a legal basis to detain and keep the defendant at the scene. While the defendant did ultimately consent to a search of his car, it was after the detention which the criminal defense attorney argued was illegal. Consent is not voluntary if it is the result of an illegal detention.